B-36 Peacemaker – Billion-dollar Blunder or Nuclear Deterrent? The B-36 Peacemaker, a long-range bomber, never saw action in a war. However, it certainly caused a major political war to break out between the various arms of the American Military. At the end of WWII, the US Army Air Force (USAAF) was turned into an independent service and placed under the control of the National Military Establishment. This newly formed Air Force faced some significant challenges, both at home and overseas. These challenges included a new foe in the form of the Soviet Union. In addition, the Navy was unimpressed with the idea of a new military service that took funds from a diminishing defense moneybag, especially as the Air Force was trying to implement new technology in the form of jet propulsion. 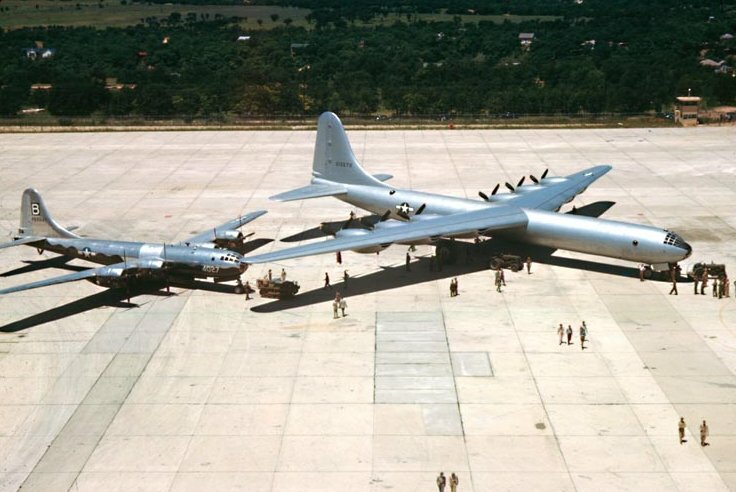 The huge new XB-36 alongside the first superbomber, the Boeing B-29 Superfortress. The wings of the ‘Peacemaker’ were 7 feet (2.1 m) thick at the root. In 1949, Louis Johnson was appointed as the Secretary of Defense, and he was ordered by President Harry Truman to economize. Johnson caused the Navy to have apoplexy when he canceled the order for their latest aircraft carrier, a week after the keel had been laid down. This carrier had been the center-point of the Navy’s strategic nuclear plan. The Navy planned to use the vessel to carry aircraft that would be able to drop nuclear bombs thousands of miles away from home soil. Johnson’s decision set off a minor war between the various military wings as both the Navy and Air Force wanted to be the provider of a means to carry nuclear weapons to all corners of the globe. The relationship between the Navy and the Air Force had been tenuous for some time. They had clashed in the 1920s about the defense of the American coast. During WWII, they had squabbled continuously over technology and finance. Now, the Air Force had become a separate service alongside the creation of the Ministry of Defense, and the Navy saw two political adversaries that threatened its power base as the defender of the nation. 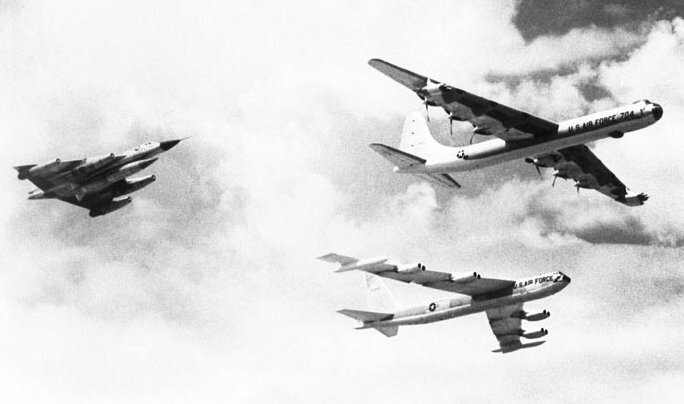 With the cancellation of the aircraft carrier order, this spat broke out into a political war that pitted the aircraft carrier against the Air Force long-range bombers in the shape of the B-36, a six-engine monster plane built by Convair (Johnson’s previous employer) that came into service in mid-1948. The following year, a salvo was fired by Cedric Worth, who was employed in a civilian capacity by Navy Undersecretary, Dan Kimball. Worth wrote a nine-page memo in which he declared the B-36 as obsolete and unsuited for its purpose. He also alleged that the Air Force purchased the plane after Convair donated millions to various Democratic Party politicians. 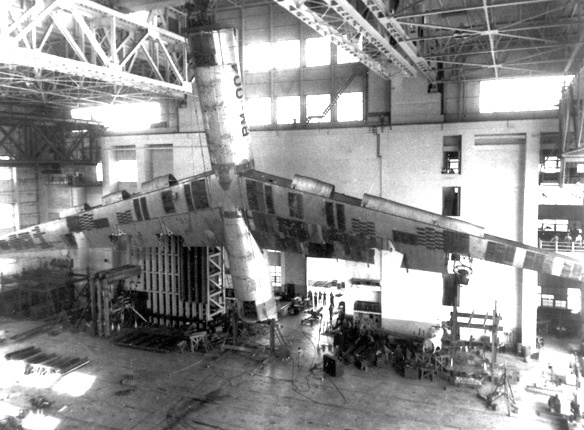 This was followed up by claiming that the Navy League had spent thousands to produce reports showing the B-36 as an ungainly, lumbering beast and declared that it was a billion-dollar blunder. The memo also claimed that the Navy had three fighter jets that could destroy the B-36 in the air and wanted a contest, but this was not to happen. Johnson was told that the contest would not be a good idea and the Air Force contested that fighter planes were not as agile at the altitude at which the B-36 flew. They had conducted a test in the Southern United States where a B-36 flew at 40,000 feet (12,192 meters), and three fighters (an F-86A Sabre, a Republic F-84 Thunderjet, and a Lockheed F-80C Shooting Star) were given the task of intercepting it. The B-36 was picked up on the radar, 30 minutes out from the airfield and the three fighters took off. It took them 26 minutes to climb to an altitude of 40,000 feet and then a further two minutes to find the bomber. The fighters could outrun the bomber, but because of their wing configuration, they were incapable of turning sharply in the thin air. As a result, the Air Force concluded that, even if Soviet fighters could catch a B-36 after it had been detected, the bomber would be able to evade them by flying a zig-zag course. The battle between the Navy and the Air Force then moved into the political arena. Politicians began insisting that the B-36 project would have been canceled long before, if not for the shenanigans of Johnson and Convair, along with the head of the Air Force, Stuart Symington. 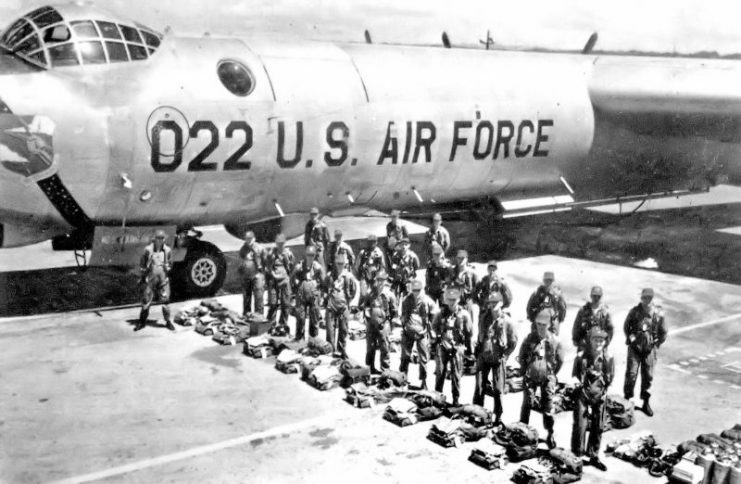 Personnel and equipment required to get and keep a B-36 Peacemaker airplane in the air. 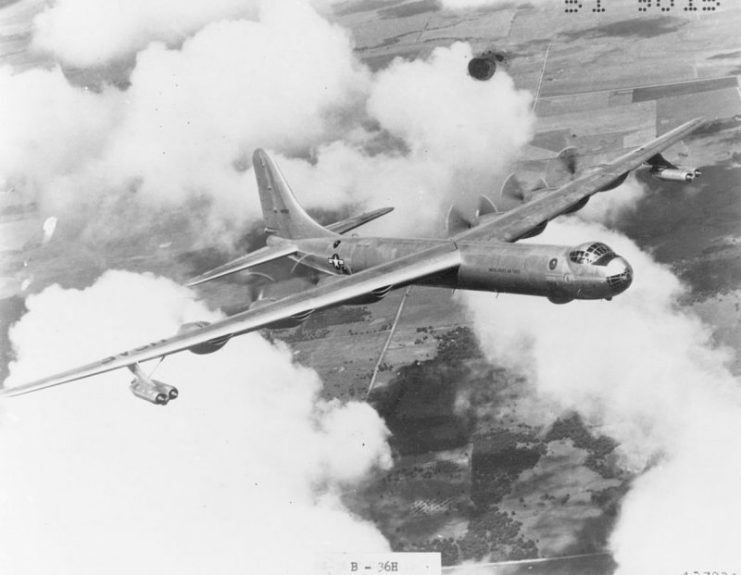 Symington had made a ludicrous claim that the B-36 could take off from US soil, fly to enemy positions, penetrate their defense systems, destroy any industrial installations, and then return to US soil, all without having to refuel. This incredible claim was widely believed, so the US Congress decided to hold hearings on the matter. The inevitable political meddling ensued. After many long delays, the hearings took place, but they had been expanded to include the strategic positions of the Navy and Air Force. Cedric Worth, the author of the original report, was browbeaten during the hearings. He eventually said that his estimations were wrong and he recanted his original memo. 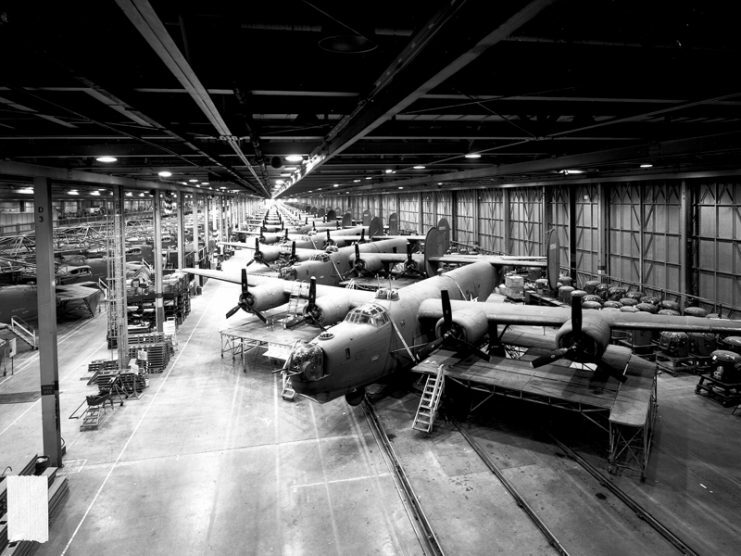 RB-36s in production. Note the heavily-framed “greenhouse” bubble canopy over the cockpit area, used for all production B-36 airframes. The DNA of the B-36 came from a series of bombers that were steadily getting larger and larger. The B-36 was developed out of the DNA of the B-24 Liberator and was developed in response to America’s fear that England would be invaded during WWII. The Americans wanted a plane that could fly from America, bomb in Europe, and then return to home base in America. The B-36 was the proposed mega-bomber. Its plans showed that it stretched 230 feet (70 meters) from wingtip to wingtip, could fly at a speed of 300mph (482kmph) across the Atlantic to penetrate German airspace, and drop 10,000 pounds of bombs from an altitude of 40,000 feet. The Army was vastly impressed with the design and ordered two prototypes on November 15, 1941. Shortly after placing the order, Pearl Harbour was bombed and America found itself mired in a war over two oceans. 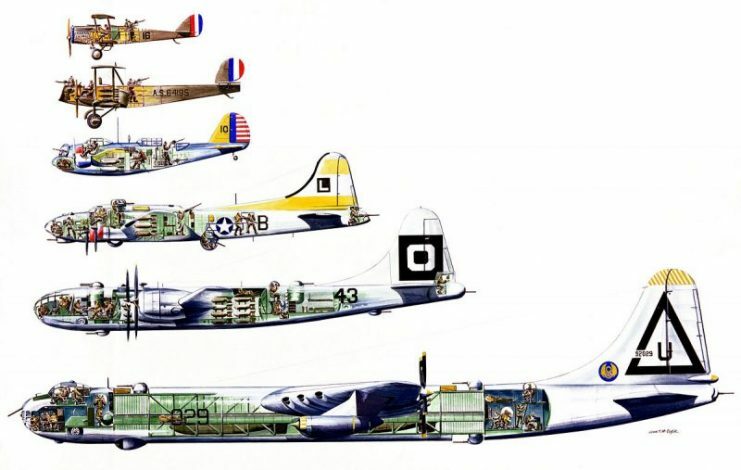 The plans for the B-36 were shelved and the B-24 Liberator was built in its thousands. While the Americans flew missions into Europe from bases in England, they planned to fly missions to Japan from bases in China using the Boeing Superfortress. When the Japanese set out to capture the airfields in China, the plans for the B-36 were suddenly brought to the fore again. The US believed that they could use Hawaii as a base to fly the B-36 to Tokyo, drop bombs and then return to Hawaii. In June 1943, the Army placed an order for 100 B-36s and expected delivery of the first planes by mid-1945. The Marines moved through the Pacific theatre quickly and soon the Superfortresses were pounding Japan. The war in the Pacific ended earlier than expected, six days before the roll-out of the first B-36. The B-36 was named the Peacemaker, but this name never stuck, so it is remembered merely as the B-36. With the end of the war came the American demobilization, although many critics termed it a rout. Having demobilized their forces, the Americans then found themselves faced with another foe that was every bit as hungry for land as Hitler and the Japanese had been: the Soviet Union. The Americans could do little to stop the expansion of the Soviet Union. It seemed the threat of nuclear war was the only thing that would stop the land grabs of the Soviet power-block. The question was: which arm of the military could support this threat? Special photo of Air Force bombers from the 1930s through the late 1940s. 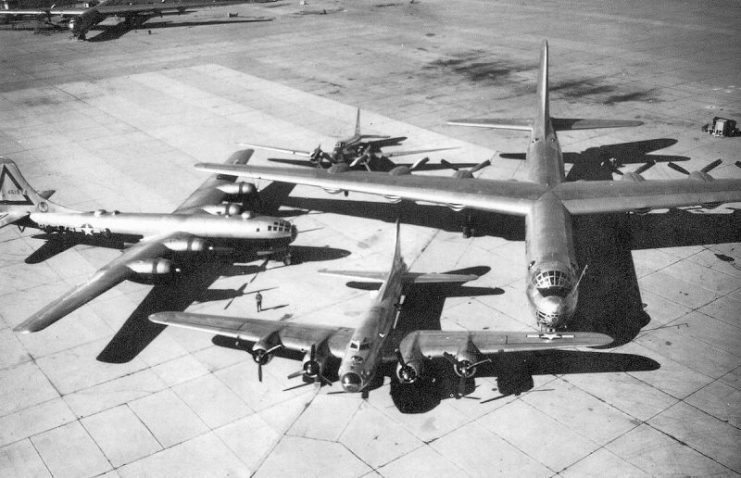 A Douglas B-18 “Bolo”; a Boeing B-17 “Flying Fortress”; a Boeing B-29 “Superfortress” and the B-36 “Peacemaker” dominating the group photo with a 230-foot wingspan. With the creation of the USAF, came two arms for the new air force. One would be a Tactical Air Command (TAC) that would provide air support for ground troops, the other would be a Strategic Air Command (SAC) that would be responsible for taking the war to the enemy. The new USAF would have 24,000 aircraft at its disposal, and only the Air Force would carry heavy bombers. It was fortuitous that a payload of 10,000 pounds for the B-36 was precisely the weight of one atomic bomb and, in theory, the aircraft could fly from Maine to Leningrad and back again. 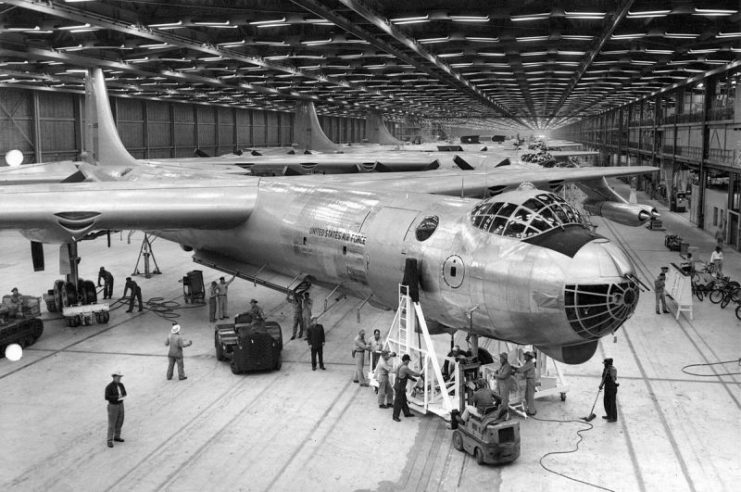 The Air Force impatiently waited for the delivery of its new B-36s, and, in the meantime, the SAC made do with 160 Boeing Superfortresses. 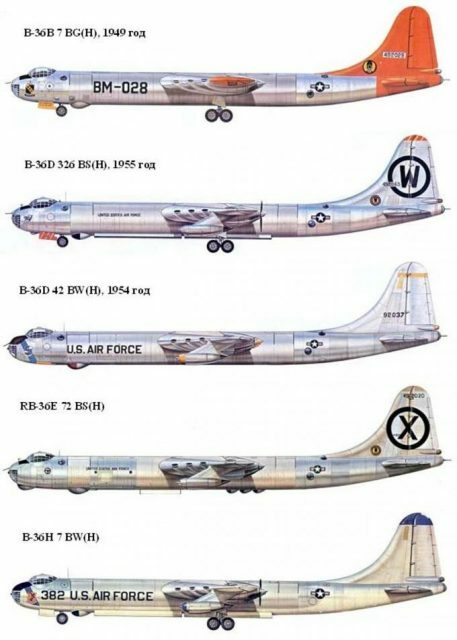 These were the planes that were deployed to European bases when the Soviet Union encircled Berlin in mid-1948. This was a large bluff by the Americans as the Superfortresses sent to Europe could not carry the atomic bomb. The 27 that had been modified to carry the bomb were all retained in America. Compounding the bluff was the fact that America had a total of 13 atomic bombs and it was uncertain whether Harry Truman would have released them to the military. If he had decided to use one of them, it would have taken five days for SAC to pack up and move everything and everybody to Europe to carry out the order. By June of 1948, the first of the B-36s (B-36A) was delivered to Carswell Airforce Base. The plane was long and slim, with a round cross section and two pressurized cabins that were separated by the bomb bay but connected via a tunnel. The tapered wings were huge, fitted far back on the fuselage with swept back leading edges. The wings were seven feet (two meters) thick at the connection to the fuselage, which allowed a crew member to crawl in to check fuel tanks or landing gear. This was designed to prevent turbulence over the wings, but the downside was that air to cool the engines had to be pulled in via ducts on the leading edges of the wings. This was unsatisfactory and never worked very well. The propellers were 19 feet (almost six meters) in diameter and produced a distinctive rumble that could be heard on the ground when the plane was flying at altitude. The most distinctive feature of the plane was its plexiglass canopy which enclosed the flight deck. There were also two transparent covers that were situated below the radar dome. They allowed the crew to aim the guns. In the forward cabin would be ten crew members, the pilot, two flight engineers, a bombardier, navigator, radioman, and gunners. To visit the rear cabin, the crew had to lie on a wheeled trolley and pull themselves along the tunnel using an overhead rope. The rear cabin housed bunks, a toilet, and an electric stove. The guns on the B-36A did not work, and the build quality of the plane was horrendous. The metal skin over the wings frequently pulled loose. A plane returning from a mission often required the services of sheet-metal workers to secure all the rivets that had popped off. The firewalls that surrounded the engines cracked and the engine cylinders tended to overheat while the spark plugs were regularly fouled by the lead found in the aviation fuel. The B-36 sported 336 spark plugs. After each mission, a mechanic took a bucket full of new plugs and replaced all those that were fouled. The engines leaked oil, and it was not uncommon for an engine to be shut down during flight as it had used over 150 gallons of oil. Lastly, the fuel tanks were housed in the wings, and after the wings flexed for a few hours, the sealant in the joints failed, and aviation fuel would drip out all over the place, turning the ground under the planes purple. The opinions of pilots varied with age. Older pilots who had flown worse machines during the war had fond memories of the B-36, while younger pilots thought it not such a pleasant experience. The U.S. Air Force FICON (Fighter Conveyer) project: YRB-36 and YF-84F in launch position. Preparing the B-36 for take-off took around six hours. The pilots needed a further hour to work through the 900-point pre-flight checks, which started with them climbing into the wheel well to remove the chocks that stopped the landing gear from accidentally folding up. Crashes were inevitably fiery affairs as the plane contained significant amounts of magnesium. One pilot said he would rather join the infantry than fly another B-36A. The plane and SAC were somewhat ineffective at the beginning. The first commander of SAC, General George Kenney, stated that he thought money should be put into high-speed bombers even if they had to be flown from overseas bases. 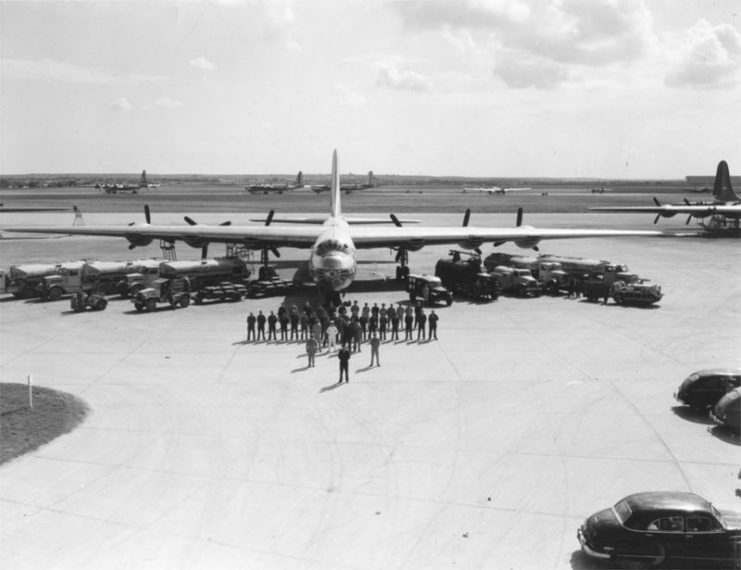 This caused some consternation, but by the end of 1948, the B-36B had arrived. 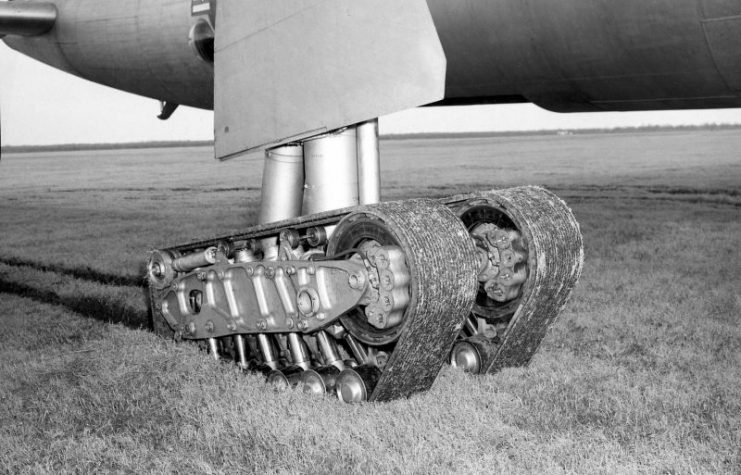 Convair B-36 with experimental tracked landing gear, to reduce ground pressure for soft-field use. Seven years after Pearl Harbour, Lieutenant Colonel John Bartlett took a B-36B from Carswell Airforce Base in Texas and flew it to Hawaii, where he dropped a dummy 10,000 bomb and then flew back to Carswell, without refueling and without being spotted by radar stations on Hawaii. This proved that the B-36 could fly the distances that had been predicted at the start of the program. By 1949, the jet engine had undergone significant development, so it was no longer the fuel-hog that it had initially been. Now it seemed that the jet was able to cross oceans. 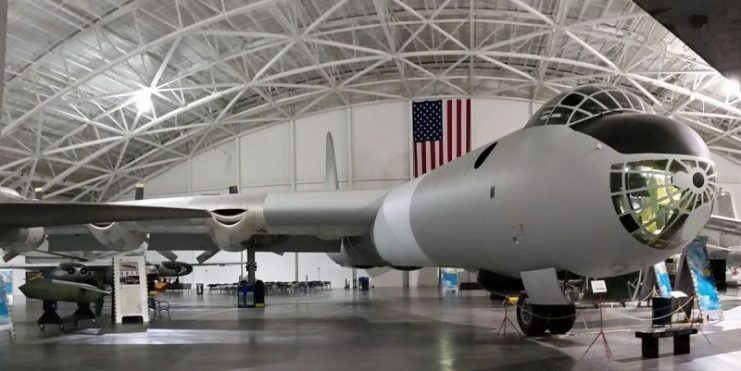 Boeing were moving forward in their planning for the B-47 Stratojet, and the enormous B-52 Stratofortress was in advance design. The Air Force was now concerned about the B-36, and they asked Convair to try placing turbo-jet engines on the tips of the wings. Convair did this, and the B-36 flew with six propeller engines and four jet engines which allowed it to fly at over 400mph (almost 644 kmph), climb very fast, and speed across enemy territory. Sadly, this was too little, too late as jet fighters were flirting with the sound barrier and the Russians were matching the output of the weapon by the Americans. 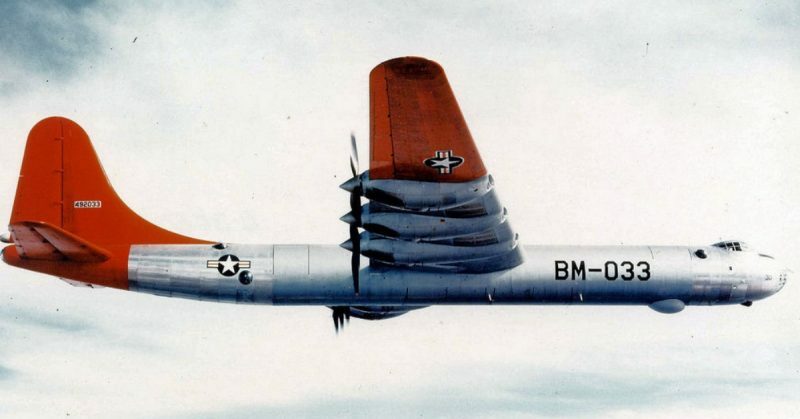 As a result, it was recommended that the B-36 only be used in night missions. On June 25, 1950, the North Koreans forced Harry Truman to reverse his economy drive as they crossed the 38th Parallel. Once again, war had advanced the cause of the B-36. Truman also released nine atomic bombs for use by the military. 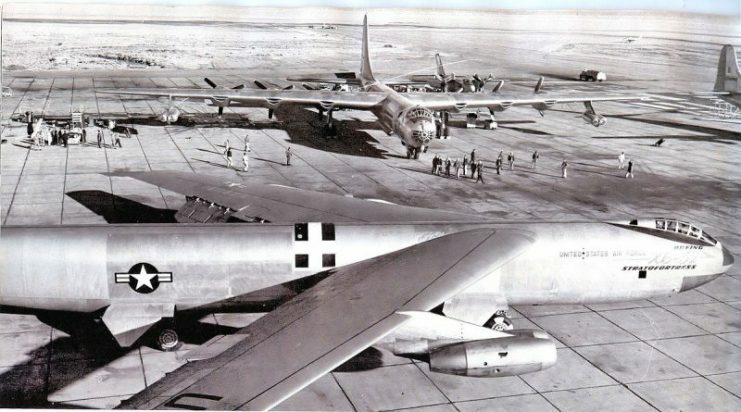 To send a clear message to the Russians, six B-36s flew from Texas to England and Morocco for short visits, thus confirming that most of Russia’s territory was now within combat range of the B-36. By 1955, there were serious doubts about the validity of the B-36 and rumbles about replacing it were becoming deafening, so Convair took a new route and supplied the RB-36. This new variant had only two guns. All the luxuries, such as the stove, had been stripped out and it flew with a smaller crew. Such changes gave the aging bomber a more extended range and equipped it correctly for a new role as a spy plane. In the forward bomb bay was loaded an enormous camera that took a roll of film 1,000 feet long (304 meters) and 18 inches (45 centimeters) wide. One plane filmed a golf course from 40,000 feet to help the USAF show the effectiveness of the camera. The photographs taken on this flight were displayed at the Air Force Museum in Daytona. Even individual golf balls are identifiable in these photographs. The RB-36 was now equipped to film military installations, tanks, armament positions, and military maneuvers. Crews spoke of missions lasting 45 hours as the featherweight plane had extra fuel tanks loaded in the bomb bay to extend its flying distance to around 9,000 miles (14,484 kilometers) and it flew at around 40,000 feet. 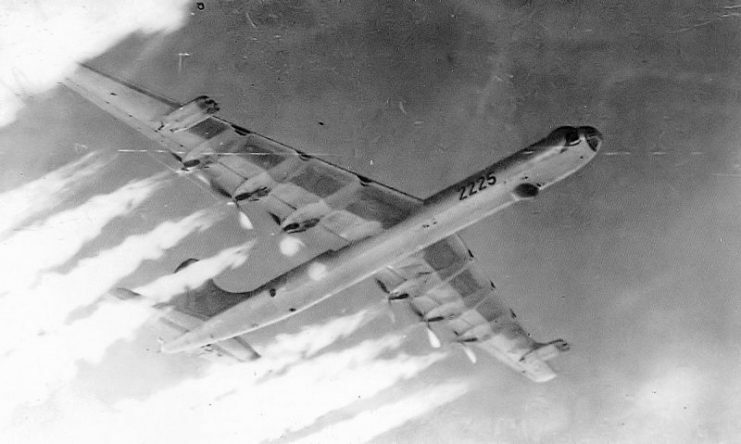 Some crews reported that they flew up to 58,000 feet (17,678 meters), escaping MiG fighters that were attempting to chase them but could not climb to the same altitude as the RB-36. 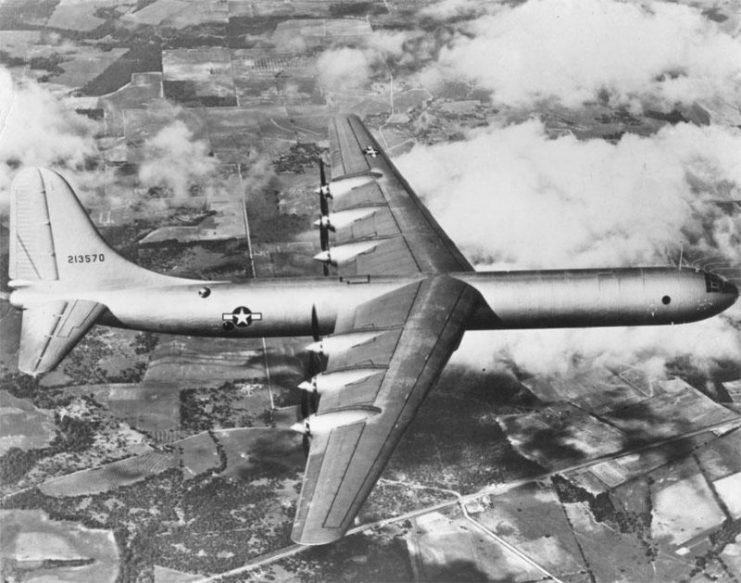 The B-52 eventually superseded the B-36 toward the end of the 1950s. The political war between the Navy and the Air Force also died down as the Navy built submarines capable of carrying nuclear missiles. The nuclear subs, along with land-based missiles and long-range bombers, formed a deadly triad that met the international threat. The B-36 Peacemaker never dropped a bomb and never went to war, but it did live up to its name and went a long way towards keeping the peace. During the time that it was in service, the atomic bomb was the strategic weapon of choice, and the jet engine came into being. This plane spanned those two eras. It might have been clumsy and poorly made, but it served its purpose, and it is unfair to claim it was a billion-dollar blunder.